Tom, I would be delighted to see your documentary. Ok, how do I view it online? Kenny Dreer is a really important part of the Norton story, and this film is no more than his due for a great contribution. I look forward to this. Tell us some more about the Fowler Formula too please. I would really like to view the Fowler Formula. I too would like to see The Fowler Formula and any subsequent movies please. Cam, I’ve sent you a link. I’ve tried to reply to each comment, but please let me know if I missed any of you. As for subsequent movies — we hope to get distribution for American Norton, so with luck you’ll be able to see it in a theater. 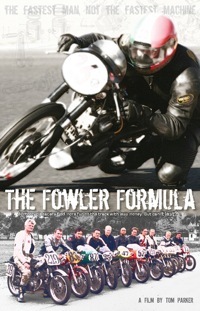 I’d love to see the Fowler Formula film, please. Heard some great things about it … from non-motorcycle folks (so well done, there). Please send me link to film. Looks like a great story. I’ll send you instructions privately. Thanks for asking!